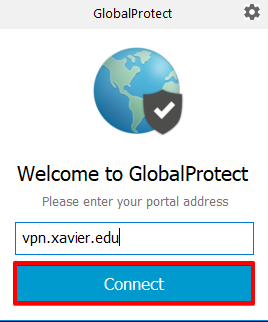 Open a web browser and go to https://vpn.xavier.edu. Login using your Xavier credentials. Click on the appropriate download for your machine. All Xavier-supplied Windows 7 computers run Windows 64 bit. If you are unsure whether your Windows operating system is 32 bit or 64 bit, use this Microsoft checker. Save and run the GlobalProtect .msi install file that you downloaded. This will launch the setup wizard. Click Next and accept the default installation folder, and Next to confirm the installation, followed by Close to complete the installation. After installation is complete, you will be presented with the GlobalProtect window. 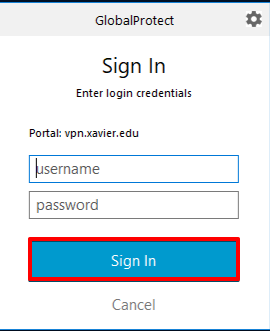 Enter the portal address vpn.xavier.edu and click Connect. Enter your Xavier credentials and click Sign In. 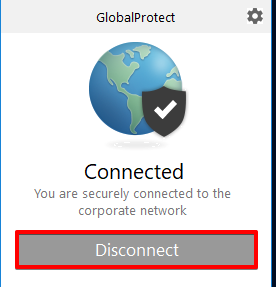 The GlobalProtect window will indicate when you have connected. If you no longer need VPN access, click Disconnect. If you are on a home or non-Xavier PC, and need access to your network drives, they will need to be manually mapped after connecting to the VPN.